What In The World Is Arm Knitting And Why You Should Try It? If you are an experienced knitter, you may be aware of the different techniques that can transform a spool of yarn into something extraordinary. Most techniques will ask you to modify the pattern of the piece, by stitching in ribbings, cables, laces and textures like embossed leaves. If you want to really tweak the way you create a piece, you should change up your tools instead of the pattern of your piece. So, you should put away your regular knitting needles because your own two arms are the only tools that you need. This craft replaces traditional knitting needles with your arms so that you pull the material into the appropriate pattern. The concept is similar to the technique of finger crocheting, which asks you to use your fingers and hands to make a pattern instead of the usual crochet hooks. The technique is considered a good introduction to knitting and an easy task for anyone who still calls themselves a beginner. If you are an intermediate or heavily experienced knitter, you can quickly add this skill to your repertoire and reserve it for times when you feel like switching up your routine. You will need to be careful when choosing the yarn for arm knitting—any choice that is fine and delicate will be too finicky to create a good finished product. The yarn needs to be long enough to wrap around your arms and thick enough to maintain a noticeable pattern. To get the right material for your piece, go to the website Yarnspirations — they have an incredible range of yarn fibers, weights, colors and brands available for you to peruse. For the sake of arm knitting, you should consider their most substantial options like the Patons Cobbles yarn or the Bernat Mega Bulky yarn. Both of these choices come in classic shades like black and white, along with rich colors like plum, teal and gold. Visit the website to find the perfect yarn for your project and place your order online — the average time it takes to deliver to locations across the United States and Canada is only thirty-six hours. When using a bulky yarn, you can’t craft items that are small or intricate like socks, gloves, headbands, mittens or slippers. 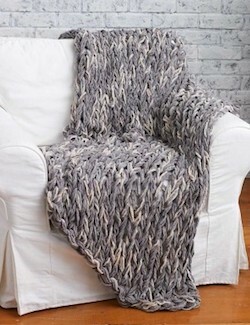 The size of the material means that you should think of bigger, thicker and heavier pieces — this is why arm knitted blankets are incredibly popular and have tutorials all over the internet. Other interesting arm knitting projects include items like infinity scarves, cowls, super scarves and shawls, as long as you stick to a pattern that suits your skill-set. Picking a pattern that’s too complicated could leave you tangled in yarn and overwhelmed about the entire project. You don’t need knitting needles in order to make a knitted piece — you simply need your two arms and the right kind of yarn. As long as you aren’t intimidated by the unfamiliar technique, you will end up with a fabulous final piece and a brand-new skill.